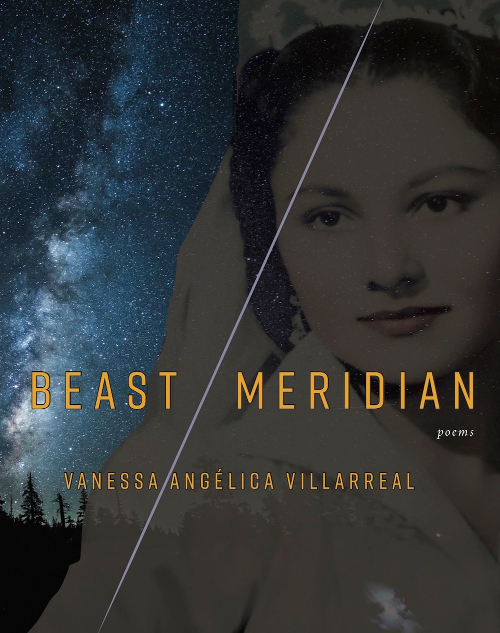 Reading Vanessa Villarreal’s Beast Meridian is like looking at a photo album and recalling memories you don’t quite know if you truly have or if you’re just imagining having them because of the emotion they incite. It’s like hearing Spanish when you’re a pocha, not being able to discern the words and yet feeling it like a gold tripwire in your senses. Beast Meridian is not just a collection of borderland, Latinx or Chicanx experiences and the stages where whiteness erases them—it is a physical place, a liminal house in which the speaker confronts her life in the eternal hallway of the subconscious. It is part starter home (two-bedroom to be exact), part nepantla, part tenth dimension, part chisme (from all the tías not just that one—you know that one), part history, part open sky. where she expresses the singularity of his nature, his songs, his sentimentality. These are what also make her father ill-suited for “American” culture, and illustrate how discrimination can drain the spirit and “drown your music” until the unbelonging becomes a place of its own. Villarreal also illustrates spaces like this for queerness, intense grief and displacement—both within the self and in the world, creating a punk take on the Latinx experience. Beast Meridian’s poems rebel against the shape rebellion can take and challenge the reader to read and recognize nepantla in alternative forms. schools and parents may feel pressured to assimilate children into mainstream culture for children’s survival and success, resulting in further loss of culture of origin and/or marginalization from both cultures.”—Yoon, Eunju, et.al. “Content of Analysis of Acculturation Research in Counseling and Counseling Psychology: A 22-Year Review.” Journal of Counseling Psychology, Vol. 58, No. 1 (January 2011):83-96. Too often in the past, Latinx poets have been forced into a singular perspective that romanticizes traditions without looking at the inextricable violences that have born and maintain them. Beast Meridian excavates the speaker’s desires, confusions, and even their learning “For the great violences hidden inside women / For the women hidden inside great violences.” It sources them and holds readers accountable for seeing, for knowing. These poems are uncomfortable to read because they hold you by the chin, but the grip is that of a caring elder or a loving child. It is remarkable how Beast Meridian communicates how deeply Latinx love can hurt in poems like these. The second section, A Halo of Beasts, assigns the speaker’s ancestors and family the honor of constellation, of prayer, and of myth, in a series of persona poems where the speaker is both the ancestor, the family member, and the poet herself. The collection, already in the form of a triptych through its three sections, makes a triptych of the speaker’s voice in this second section. Each poem guides the figure from the first section through a type of forest—a place of transformation. Villarreal writes this amorphous dimension into existence, and models the body as haunted terrain, as historical artifact, as limbo, and also as the way through grief. The poet honors the subconscious, the stored source of trauma by traversing heavy-footed through these spaces, not stopping to look back, not speaking to the reader for affirmation or direction, as some poets do when exploring such mysterious territory. Villarreal stays. Villarreal goes. She looks to ancestors collected in constellations. She honors the mother who loves Coca-Cola and hamburgers. She fairy tales the route for daughters. Every move is balanced but clear in this interior map of trauma, the one we feel is in the body but have never been able to navigate it. She draws it out. Writing it any other way, with allegiance to chronology or to what can be seen, would be another kind of erasure. Beast Meridian ’s subversive use of form disempowers stories of assimilation by subverting them, often in a childlike point of view in forms like progress reports, fairy tales, and assimilation rooms. “Assimilation Rooms” is a six-page poem that creates six different rooms where erasure happens systematically. Each section’s straight-bordered form is organic. The ease with which we can accept such violence is elegantly disguised as order. Each “room” is solidly built and the do not fold. “Assimilation Rooms” prompts us to ask: what is order and what is its danger? What does it serve? If order is a recognizable and acceptable pattern, it is dangerous because we’ve learned not to confront it. We accept patterns, and we accept who or what has historically created them. The footnotes work to disturb and redirect the reader’s acceptance of institutions and formal speak. At one point, Villarreal copies the same quote from a psychiatric study over and over until it becomes illegible, giving form to the ways in which voices that utilize “high diction” in government, academia, and the justice system often keep certain people out of the conversation and disempowered. Villarreal’s sturdy poem reveals this language as unstable, as surface. She punctures the crust of diction and, therefore, power. Eduardo C. Corral says, “To privilege one language over another is to privilege one way of seeing over another, and I refuse to do that.” The first section of “Assimilation Rooms,” takes the narrative of a young girl learning English and translates it from Spanish. The horror and coldness is the only thing that survives in the transition of one world to the next. This is not against Corral’s philosophy. What Villarreal does is not a privileging, but a reveal—she shows us what is lost when we undermine the strengths inherent in pre-colonial culture, in colonized bodies and in indigeneity. In this part of “Assimilation Rooms,” specifically, it is the admiration and adoration read through “ropita . . . abuelita . . . cuartito.” We are left with “in . . . the honey tree . .. I can read . . . alone in this room . . . with the boogey man.” But the “ito” and “ita” as a term of endearment is a quality of pre-Cuauhtemoc languages. So when we lose the Spanish, we also lose the indigenous traditions of language, the ones that have faded even prior to the poem. Not only does a loving language fall away with the grey lettering, the fading due to assimilation, so does the speaker’s indigeneity. The speaker we imagine saying “I sleep in her little room because together we can watching novelas and kneeling to pray to the virgin and the candles,” is powerless. The choice Villareal makes to depict the speaker as child enacts how policies of assimilation devalue and further marginalize us at our most vulnerable. These poems challenge the reader to consider their participation—both their propagation and their victimhood in practices like this through our preferences, our righteous behaviors, our desire to save our children from discrimination. What is it that we save? What is it that we push into the background? Can a whole person remain? Vanessa Villarreal’s collection acts as a preservation but also as a map through the liminal space we call identity. Beast Meridian is a collection crucial to the landscape of contemporary poetry in the United States. In Angels of the Americlypse: An Anthology of New [email protected] Writing, editors Carmen Gimenez-Smith and John Chavez write in their introduction: “Rather than sit at our drafting tables as aesthetic innovators, we Latinos are expected to normalize our histories and tell the ancestral tales of our colorful otherness.” The force of Villarreal’s collection is that it does both. It recounts without false honor. It innovates form in surprising ways that feel ethical to the brown body. It does not assimilate (to whiteness or to internalized whiteness disguised in cultural expectations & respectability). Beast Meridian is challenging because the complex is challenging. It is hard to reconcile our bodies and lives with history and our failure to acknowledge this wide tangle we are all caught in. What Villarreal does is turn this complexity into a tangible landscape to navigate. Here the path is treacherous, but the ground is solid—the way forward as necessary as it is difficult. 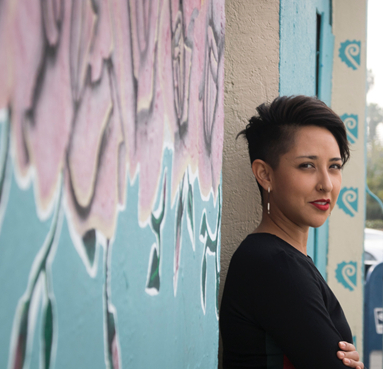 Sara Borjas is a 3rd generation Chicana from Fresno, California. She holds fellowships from CantoMundo, the Postgraduate Writers’ Conference at Vermont College of Fine Arts, and Community of Writers at Squaw Valley. Her poetry can be found in The Offing, Entropy, and Queen Mob's Tea House, amongst others. She is the recipient of the 2014 Blue Mesa Poetry Prize. Sara has been to college twice and adores tiny prints, astrophysics, oldiez, and aromatics. Her debut poetry collection, We Are Too Big for This House, is forthcoming from Noemi in 2019. She currently lives in Los Angeles but stays rooted in Fresno.